When we make homemade pizza, I like to go all the way homemade and make the dough, too. It's easy enough to buy a can of dough or some pre-made dough from the grocery store, but I can assure you, it's just as easy to make it yourself (and more gratifying, to boot!). I love this super simple bread machine recipe. I use this for pizza, calzones and pepperoni bread. It can be rolled as thin as you like or left a little thicker for a nice hearty chewy crust. Place ingredients in your bread machine in the order listed. Set the machine to the dough setting and let the machine go to work! On a lightly floured surface (cornmeal would work, too! ), roll out the dough to your desired thickness. I like to roll it out to about ¼ inch thick. 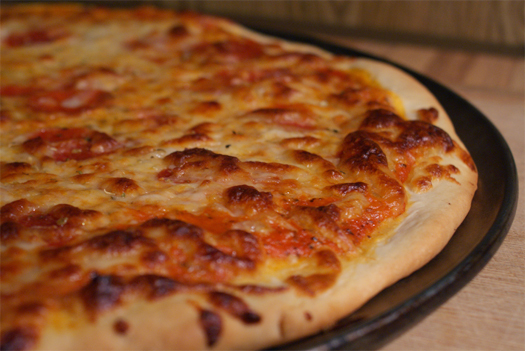 Top with your choice of sauce, cheese and toppings and bake in preheated 425° oven for 15-20 minutes. Gorgeous and pretty photos, fantastic photos!